Thousands of people capitalised on a cloudless sky and unseasonably warm temperatures around the country Thursday to celebrate the holiday of Purim with street fairs, parades, carnivals and private family celebrations. The holiday, which marks a failed attempt at genocide of Jews in ancient Persia, is traditionally marked by dressing up, charitable giving, the chanting of the Book of Esther and festive meals. 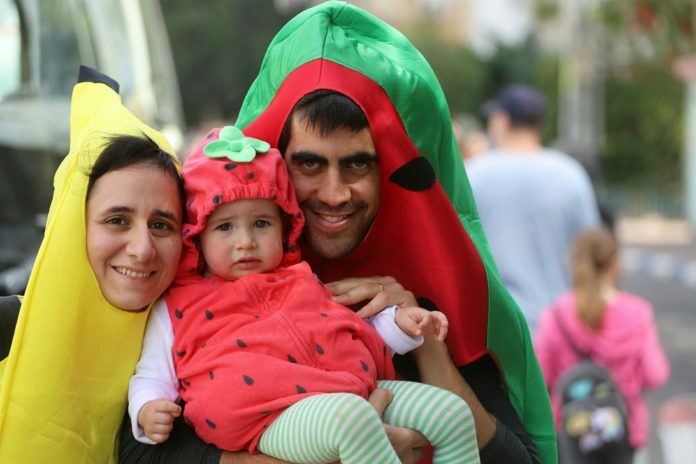 In Holon, a suburb of Tel Aviv, thousands of people attended the city’s annual Adloyada Parade, which featured majorettes, dancers, African drummers and more. In Hebron, local residents held holiday prayers inside the Cave of the Patriarchs followed by a street fair. Celebrations will continue Friday in Jerusalem, where the holiday is celebrated a day after the rest of the country.